If Mazhbi-Balmiki hold the key to victory in Kapurthala, it is the dominating force of the Adharmi and Ramdasia communities of Dalit vote mass which can affect the poll outcome of the Garshankar Assembly constituency, even as both the constituencies are heading for a neck-and-neck poll battle on October 13. The Punjab Chief Minister, Capt Amarinder Singh, said today that his government was committed to give free power to farmers in the state. “As and when the financial position of the PSEB improved, farmers would get free power as promised by my party in its election manifesto released before the last Assembly elections”. In his final effort to woo the farmers, Dalits, youth as well as the elderly for the Kapurthala byelection, Mr Parkash Singh Badal, President, Shiromani Akali Dal, today promised free power and water for the agricultural sector, revival of the shagun and pension schemes and job opportunities to the unemployed. 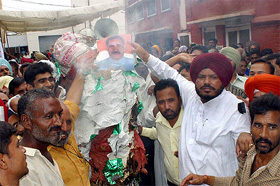 The simmering differences between Punjab Transport Minister Mohinder Singh Kaypee and Punjab Local Bodies Minister Jagjit Singh came to the fore today, when a group of Congress councillors and their supporters, owing allegiance to the former, burnt effigies of the latter and Mayor Surinder Mahey at the municipal corporation complex. Utilisation of fly ash produced by the three thermal power stations in the state has come unstuck with the Punjab State Electricity Board conveying to the government that it is not in a position to transport fly ash to brick-kilns within 100 km of its plants. The Punjab State Human Rights Commission (PSHRC) has ordered payments of Rs 20,000 as interim compensation to a complainant in a case of police harassment. In its order, the Commission also directed that the money be recovered from Inspector Paramjit Singh Buttar, one of the main accused in the complaint. Hundreds of schoolchildren in over 31 government and privates schools in the district continue to drink water found unfit for human consumption. The Health Department collected water samples from 31 schools, a majority of which get water supply from hand pumps. Laboratory tests confirmed that the samples taken during the month of September were not fit for consumption. 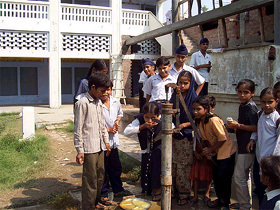 Schoolchildren drinking contaminated water at one of the senior secondary schools of Kurali. To fulfil his lust to get a son by getting remarried, Jaswinder Singh, a resident of Hariaao village of Sangrur district, today murdered his wife Sarbjit Kaur in Kot Dharmu village of this district and made an attempt to kill his two daughters by poisoning them. Lure of dollars and green pastures made Ranjit Singh, a resident of Verka, endure inhuman conditions in Malaysia. He has recently returned after going through a nightmarish experience during his stay in Malaysia, where he along with some other Punjabis landed in jail and lived in camps. 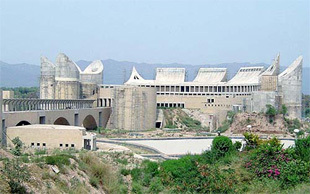 The prestigious Khalsa Heritage Memorial Complex at Anandpur Sahib is in serious jeopardy. Almost all three agencies implementing the project have threatened to withdraw from the project due to paucity of funds. The basic structure of the Khalsa Heritage Memorial complex at Anandpur Sahib. The outburst of Major-Gen Hassan Mehdi, Director-General, Pakistan Rangers, Punjab (Western), virtually blaming India for a series of bomb blasts in Multan, Sialkot, Lahore and other parts of Pakistan today set the tone and tenor of the coming high level bi-annual meeting with the BSF, proposed to be held in Chandigarh tomorrow. Around 80,000 children were administered polio drops during the first phase of Pulse Polio drive in the district today. The Deputy Commissioner, Mr Alok Shekhar, launched the drive at Government Harindra Elementary School, Ambedkar Nagar. Bhai Balwant Singh Nandgarh, Jathedar of Takht Damdama Sahib, today urged the people to avoid calling those Punjabi singers in the social functions who had been indulging in the promotion of addiction and violence through their songs. 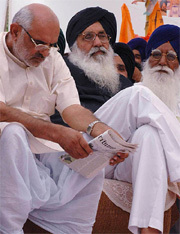 Col G.S.Sandhu (retd), president Poohla Eviction Committee, has alleged that Nihang chief Baba Ajit Singh Poohla, who has been facing numerous criminal charges, was allowed to dine and meet his men at his dera at Baba Bakala by the police party instead of taking him straight to Ludhiana jail after appearing in the court of the Judicial Magistrate, Patti, on October 9. The Additional Inspector-General of Prisons (Delhi), Mr Gyanendra Srivastava, today presided over the passing-out parade of a batch of trainees from the Tihar jail at the Punjab Jail Training School here. On a call of the local Press Club over 100 mediapersons of the Fazilka, Abohar, Jalalabad, Guruharsahai, Ladhuka and Ghubaya areas held a procession in protest against the arrest of Surinder Chugh, chairman of the club, allegedly on a false FIR. Hundreds of members of the Hindu Dharam Suraksha Samiti today held a demonstration in front of the Deputy Commissioner’s office here to protest against a local Hindi daily which had published some defamatory feature against Devi Chinpurni. One person was killed and four others were injured in three separate road accidents during the past 24 hours. Balwinder Singh, a resident of Burj Hari Ke of Faridkot district, died when a speeding car hit him. In a sensational incident, two minor sons of a BSF personnel died after drowning in a swimming pool inside the PAP Complex on Sunday. Market fee and sales tax worth crores are allegedly being evaded by unscrupulous traders and ginning and pressing mill owners as they have been making huge transactions in cotton purchase by not bringing the same on the official record of different grain markets in the cotton belt of Punjab. The CIA staff today arrested three local youths and seized two pistols and a knife. They were arrested near Sem Nullah at Bahona village while planning a criminal activity. In a bid to buy peace, the management of Khalsa College today sent the Principal, Mr J.S. Dhillon, on three months’ leave. However, Mr Charanjit Singh Chadha, vice-president of the college management, said the governing body of the college had sanctioned three months’ “study leave” to Mr Dhillon after he applied for it. Mr Chadha said the students’ strike against the Principal had been called off. The District Education Officer today started a probe into a case in which the girl hostellers of Chanda Singh Marwah Senior Secondary School were allegedly kept without food by their principal because they had protested against the fee hike. The Government School Lecturers Union, Punjab, today demanded that the salaries of teaching and non-teaching staff working on plan posts in the state should be release at the earliest. They were paid their last salaries in May. As many as 13 junior and six senior teams of local schools and colleges participated in a national group song competition organised by the Bharat Vikas Parishad at SSD Girls College. DAV College, Amritsar, bagged the A Zone Overall Trophy while SGAD College, Khadoor Sahib, lifted the B Division Championship at the Zonal Youth Festival of Guru Nanak Dev University, which concluded here today.